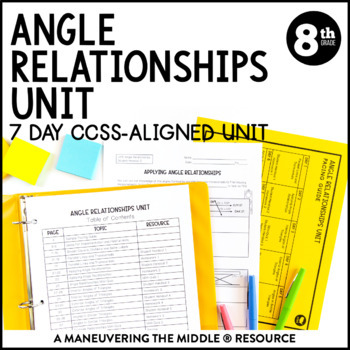 A 7 day CCSS-Aligned Angle Relationships Unit - including parallel lines and transversals, angle sum of triangles, exterior angles of triangles, and angle-angle criterion with your students. Texas Teacher?Grab the TEKS-Aligned Angle Relationships Unit.Please don’t purchase both as there is overlapping content. 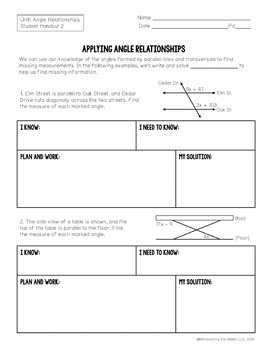 Please note that classroom activities are NOT included but can be found in my Angle Relationships Activity Bundle. 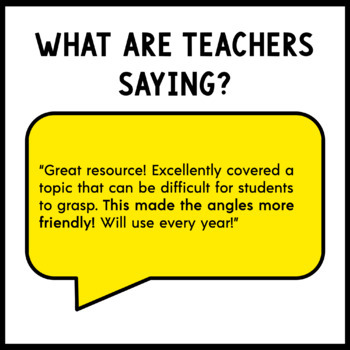 Interested in other CCSS-Aligned Angle Relationships Activities? 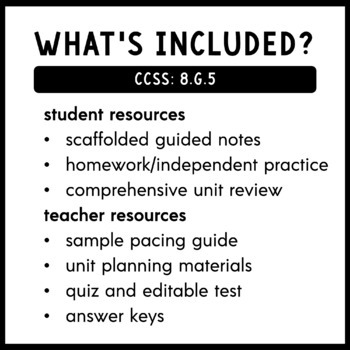 Check out my Angle Relationships Activity Bundle, Angle Relationships Unit Bundle, or 8th Grade Math CCSS-Aligned Curriculum Bundle.